If your gas furnace is blowing cool air, it could be a simple fix – or a complicated repair. Here are three common causes for cool air coming from your furnace that you can fix yourself. 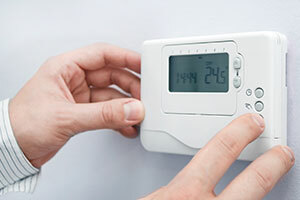 Your thermostat is set to ON – If your furnace is blowing cold air only some times – even though the blow is constantly running – the problem could be your thermostat. If your thermostat’s fan setting is set to ON, the blower will run even when your furnace isn’t heating the air. Your furnace has overheated – If your furnace has stopped blowing warm air after consistently blowing hot air, it could be overheated (your furnace has a “limit switch” – a safety device that turns the furnace burners off; the blower keeps operating to cool the furnace). What causes the furnace to overheat? More often than not, a dirty furnace air filter is the culprit. By blocking airflow, the clogged air filter causes the furnace to overwork to heat your home. Solution: Change the air filter and see if your furnace starts operating properly again. DON’T IGNORE THE PROBLEM! Repeated overheating can damage the furnace’s heat exchanger, which is expensive to fix. Solution 1: If you’re comfortable with doing so, re-ignite your pilot light, following the manufacturer’s instructions carefully. If you’re not, don’t worry – just contact us. Solution 2: If the pilot won’t light, make sure the furnace’s gas valve switch is in the “on” position (parallel/in line with the gas supply pipe). Solution 3: If the pilot lights but won’t stay lit, your thermocouple (the copper rod you see contacting the pilot flame) needs to be adjusted or replaced – a job for professional technician. Still having problems? Ask one of our experts! Give us more details about your problem, and we’ll get back to you ASAP.